So what does that meen in real terms. Basically all the algae growth creates huge rafts of green water that turn brown as the algae die off. At times it becomes so thick that it can be seen as green or brown blobs on your line. Imagine that coating the gills of fish and you can see why they don’t want to stay in it. Colder water areas provide relief for all types of fish from the bait fish to the apex predators. It is why when fishing in tropical waters guides look for the ares that blue and green water meet to target the big predators. The exact same tactics can be used in the UK, unfortunately most of the predators are not the same size as those in tropical climates. Having said that, a number of sharks have been spotted around Portland. I have seen the pictures, but so far do not have permission t show them. One local angler has been trying for them from the shore for the past two weeks, so far without success. I have been running a trial for the past year, using some very expensive satellite feeds that give me all sorts of information. I will reveal more later in the week once I have renegotiated with the providers, as to how this information can be used for forecasting where fish are likely to be. It is perfect in May water conditions to find areas of clear water. Results from last year were pretty conclusive for me with regard to lure fishing. This year I will spend more time on bait fishing. If the results mirror those of last year, then we can all expect to catch more fish. It is not all bad news though. 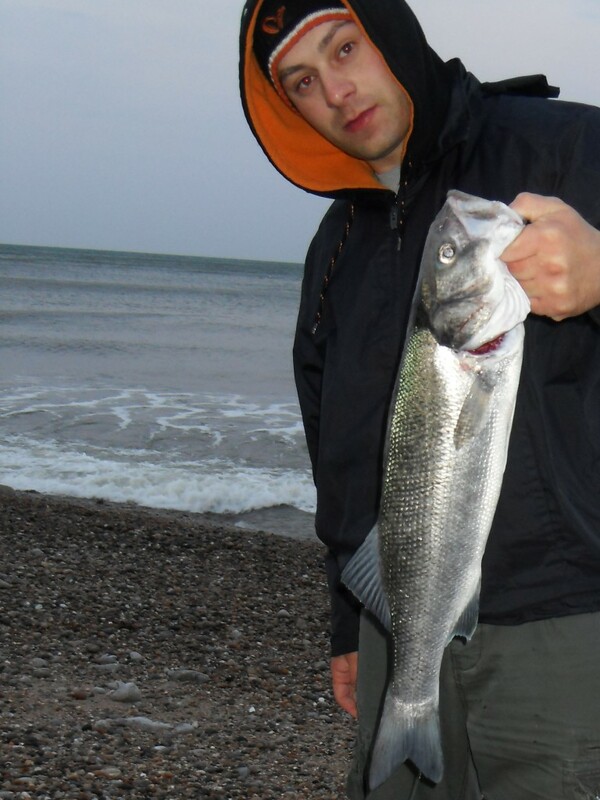 Krzysztof sent me an email with a picture of a 4.5lb Bass that he caught at Seaton on a Rapala Clacking Minnow. The vibrations from the minnow were enough to prompt the Bass to hit the lure. Chesil Beach forecast: Good luck on the beach today. A few Plaice may come from the Abbotsbury end of the beach. Night tides will produce Dogfish and Pout. Mackerel are scarce at the moment. Portland Harbour: One of the better areas at the moment. Reports from fly fishers say that Mackerel, Garfish and a few Bass have been caught. Fished between Abbo and west Bex again ( Sunday) , “may water” all the way along but a lot patchier than 2 weeks ago. Had a couple of doggies mid tide in daylight, with about 1 hour to high tide loads of bird activity, at about 70/80 yards. Managed a few mackerel, catching consistently at medium to long range both sides of high water. Some big bonus herring as well. Thanks for the algae info. I hope it’s gone soon.